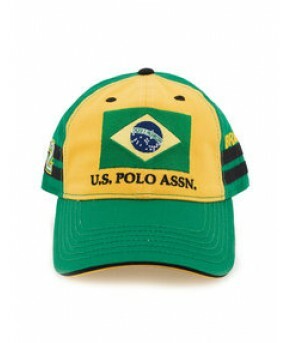 This season's sportiest baseball hat is emblazoned with Brazil and number two in bright yellows, greens and blacks. It's a great piece for any time the mood strikes, day or night. Embroidered U.S. Polo Assn. logo on front. Striped side with appliqued number two on right side. Striped side with appliqued Brazil on left side.